Peter Johnstone of Spencer Smith Miniatures has been in touch with news of interest to all who love Jacklex figures and were tantalised by the pictures of Jack Alexander's Pancho Villa figures. Following earlier postings on this blog regarding Jack Alexander's new range of 'Pancho Villa'(1917) war figures or the American Punitive expedition into Mexico, I am pleased to say that the infantry and cavalry figures are now ready for sale and I am pleased to attached a list of available figures. The artillery pieces: erhardt gun, French 75mm gun, motor cyclist and a US colt machine gun plus limbers will be due very shortly. 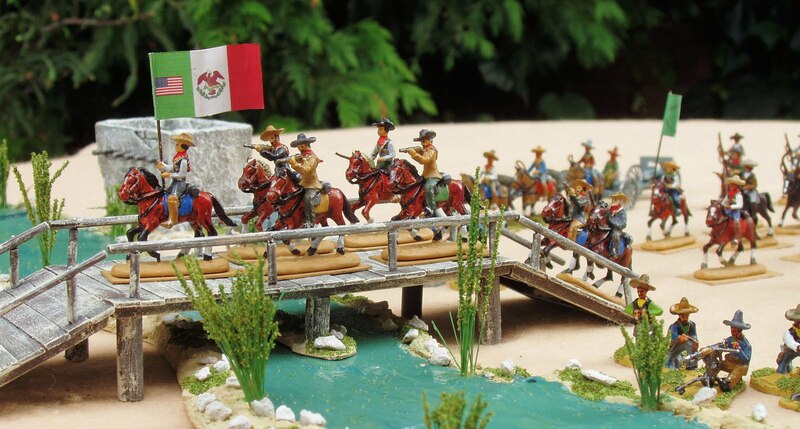 Jack points out that the Japanese WW1 infantry double nicely as the Mexican regular army figures and the Boer war range of mounted figures are useful extra figures for the American cavalry. Pictures should be up on our website very soon, but you already have some very nice pictures on your blog. Hope you can make mention of this new range. A bit unique, I think. How many soldier makers leave it 35 years before bringing out new figures? I will let you know when I have the rest of the range. Please ask your members to contact me directly for further information or to place orders via phone/post or website in the usual way. As I have just been painting some Jacklex Russo-Japanese War Japanese infantry I can endorse Peter and Jack's comments on the suitability of these figures to expand the options available.